Olson Homes – adZooks! Syndicated Banner Ad Campaign | ASTRALCOM - Content Strategy, Conversion Marketing and Customer Acquisition. Olson Homes – adZooks! Syndicated Banner Ad Campaign | ASTRALCOM – Content Strategy, Conversion Marketing and Customer Acquisition. The Olson Company is running ASTRALCOM’s adZooks! 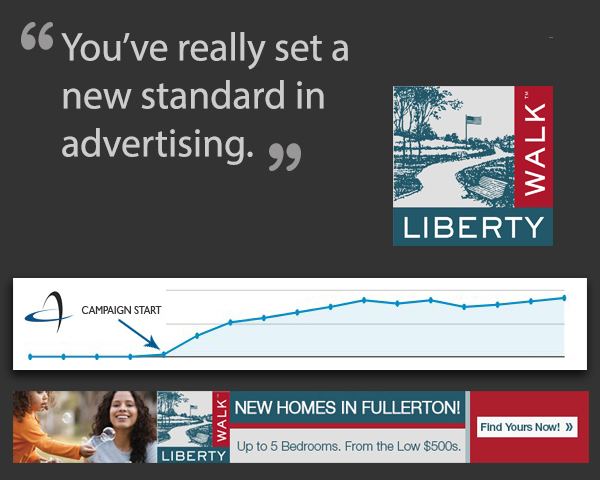 program for syndicated display ads for one of their newest communities in the Southland Liberty Walk, in Fullerton, California. adZooks! is a banner ad display program from ASTRALCOM that syndicates banner ads into any metro areas most-trafficked websites. “You’ve really set a new standard in advertising.” was the word back from The Olson Company. “adZooks! is one of our most popular programs because of its effectiveness at producing brand lift and delivering targeted traffic,” explained Richard Bergér, VP of E-Business at ASTRALCOM. “It’s an automatic success-maker, especially for our homebuilder clients,” he added. Reach more customers, more often, in more places and contact us today.